Lib Dem deputy leader Simon Hughes has called for England to have its own Parliament, while Scottish first minister Alex Salmond has come under fresh scrutiny. 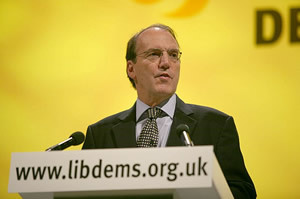 Lib Dem deputy leader Simon Hughes has ratcheted up the constitutional stakes over the future of the union by calling for England to be given its own Parliament. Following a week which saw former Welsh and Northern Ireland secretary, Paul Murphy, calling for consideration to be given again to the idea of devolution within England and the establishment by the UK government of a commission to look at the West Lothian question, Hughes used a speech to Lib Dem members in Derby on Saturday evening to dub the on-going debate about the future of Scotland “an opportunity to make an important constitutional decision about the way we make laws in England in the future too”. “The present system has become unjust to England and should not continue. At last we have an opportunity to correct this in this parliament. His remarks come ahead of a week that will see further steps being taken towards a referendum on Scottish independence. Having been challenged by Nick Clegg on the Andrew Marr programme to provide greater clarity and answers about what an independent Scotland would look like, Alex Salmond will use Burns Day this Wednesday to publish the Scottish government’s consultation on a referendum which, according to the Sunday Mail, will include a wish list comprised of allowing 16 and 17 year olds to vote in the poll and holding the vote on a Saturday in Autumn 2014. It is thought, however, that the SNP will cede to calls to allow the Electoral Commission to oversee the operation of the vote. Looking ahead to the consultation’s publication, Salmond used an interview on Sky News’s Murnaghan programme to argue an independent Scotland would be fairer for England as well as Scotland. “We will share a monarch, we will share a currency and, under our proposals, we will share a social union, but we won’t have diktats from Westminster for Scotland and we won’t have Scottish MPs poking their nose into English business in the House of Commons. Meanwhile, as the first minister continues to steamroll ahead with his plans for a referendum, the substance of his proposals have come in for attack from a group of senior, former ex-military chiefs. Following Salmond outlining his vision on BBC Scotland last week of a Scottish Defence Force that would combine the army, navy and air force, the Sunday Telegraph has carried a series of criticisms from a group of former army commanders of the plans. Just what the UK needs. More politicians. The Scottish armed forces would collapse for want of “pride”?! Is that seriously his argument! So far this week, I’ve read that the proposed units would be too few then that they were to grand for such a small country. Even I know they can’t both be right. And during all this, Labour politicians of dubious CND credentials, have explained to us why we must keep the Bomb on the Clyde: for the jobs, for the good of the nation, to avoid picking up the bill for relocation. So much for their leftwing commitment! Lord Blagger we’ll get rid of Westminster and the House of Lords and replace it with an English Parliament. Massive saving there!